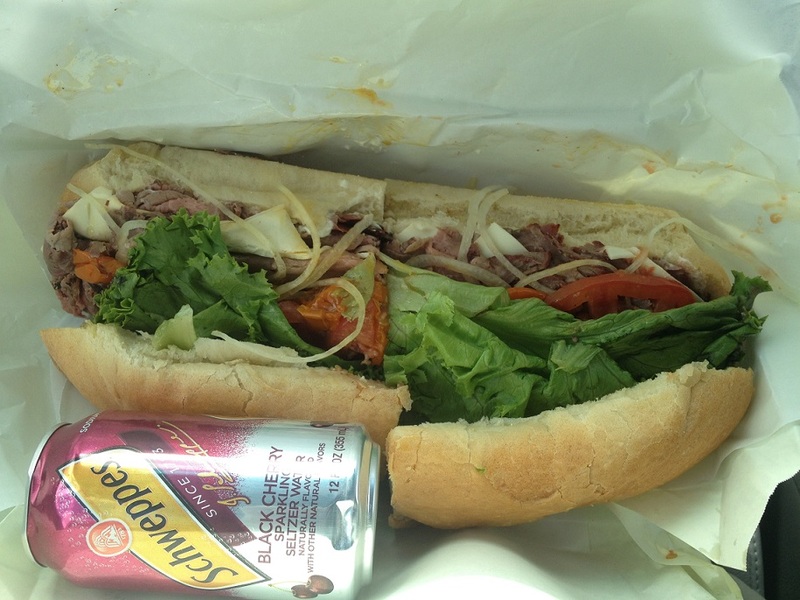 Today's visit was to Avventura's Deli in Waterbury! And, of course, dessert. I was pretty full after that massive sandwich so I just got one cannolo, for later. My friend advised me to look for something called "funny bones" (some kind of chocolate-wrapped peanut butter creme-filled cake I guess) but they didn't have those today. 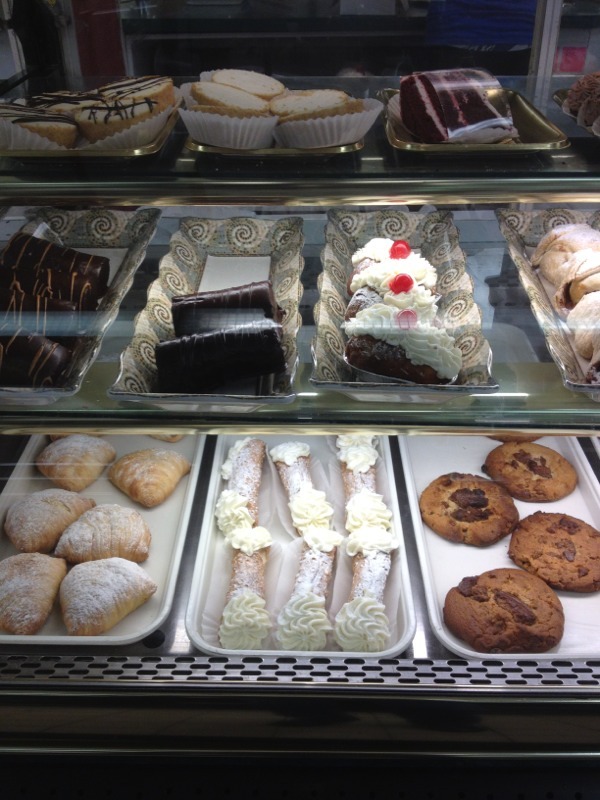 Pre-filled cannolis? The horror! They do look good though. It means something that is required. If something required is missing then the person who didn't include it must move to Washington and raise chickens and pigs. Now I know why I get asked to leave a lot of places, I don't do Mandatory! 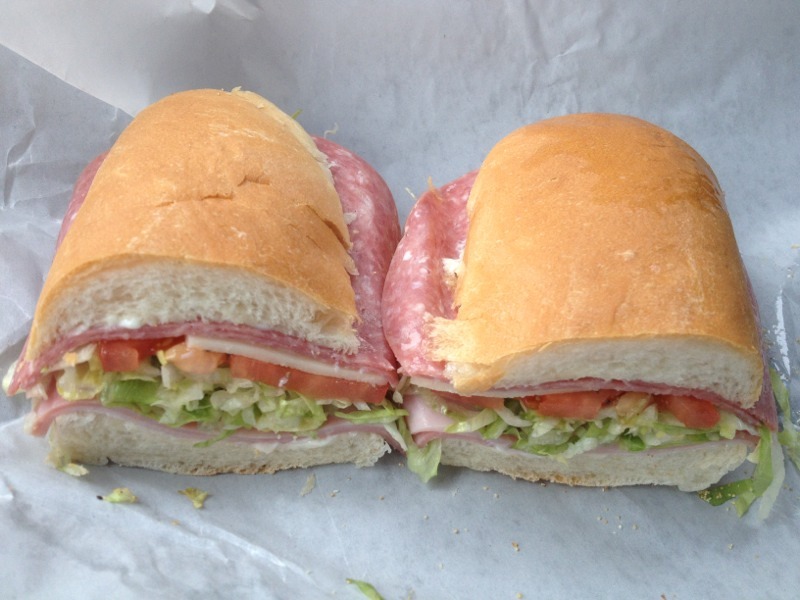 We were inspired by your trip to Carbone's in Torrington and stopped this weekend after a errand in the area. They had 3 sized sandwiches - an 8, 12, and 15 inch. I noticed that only the 12 inch came on Militi's bread - a Waterbury-based (I think) bakery - they only sell wholesale as far as I can tell. 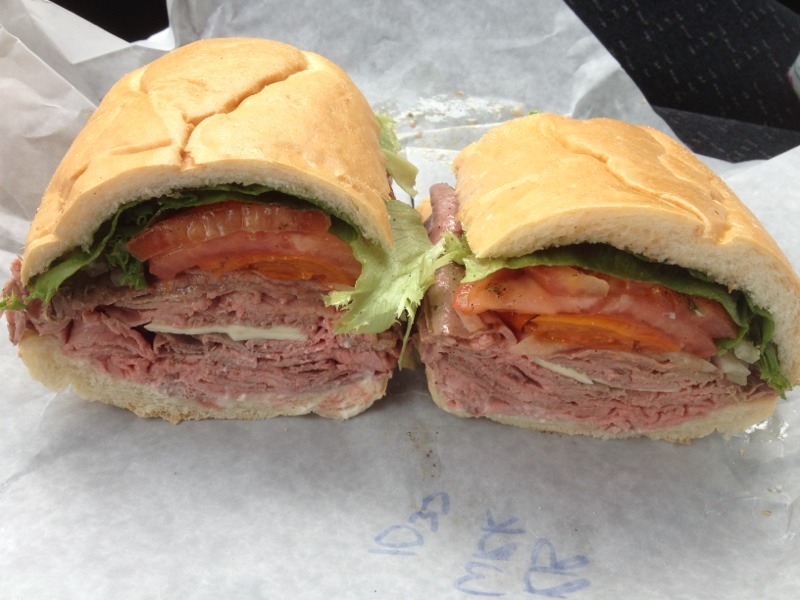 Well, we went a little crazy and ordered the 12 inch sandwiches - a roast beef, and a pork sandwich. Leftovers broken up and frozen in individual pieces (meat and each half of bread separately) for later feasts - this was a BIG sandwich. The bread makes such a difference. The first is the roast beef - lettuce, tomato, onions, cheese, mayo and oil/spices. Have to add the close ups, also....seriously good sandwich. Good heavens. I was going to do the Italian combo on my next visit, but I haven't had a good pork-and-slaw in forever. You have made my decision for me. Did you omit the roasted peppers from the roast beef? The peppers were extra so I just skipped them on the roast beef. I will tell you Tim said he probably wouldn't do the slaw again, he thought to do the slaw it needed BBQ sauce too vs just the mayo, but the pork was great. I went to Maple Giant Grinder recently. I had the combo. I was overwhelmed by the scarcity of meat. It was tasty but lacked the quantity of meat and cheese that I expected. Frigo's in East Longmeadow, MA is overwhelming with choices. This is their "Hot Cut". 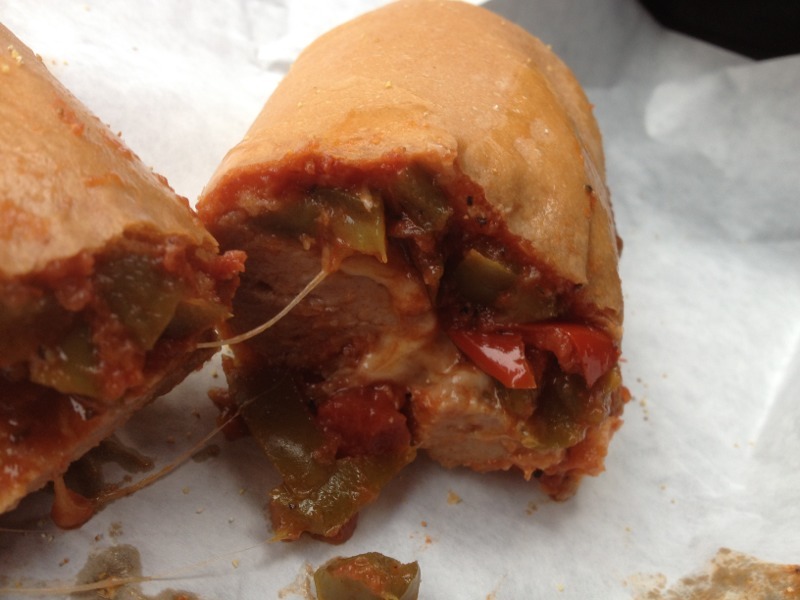 It Genoa and spicy cappicola with hot peppers. It was served cold with oil. I found it very tasty with a reasonable amount of meat. That's a shame about MGG's coldcuts. The meatball-and-sausage combo that I had there was very satisfying - their sauce and meatballs, especially, were some of the most flavorful I've had - and they did a decent chicken cutlet, though not in Franklin's or Wethersfield Pizza's league. If they're so skimpy with the coldcuts then I won't bother to try them there. Frigo's on the other hand looks great! I had a similar experience at Carbone's today. I saw the 12" was the medium size so that's what I ordered. The sandwich was $17 so I think they gave me the large. It was massive; enough for 4 meals. Next time I'll defintely order the small. The quality of the beef was outstanding. I see another visit in the near future. Stacked high with beef. My bread wasn't carved out like ketteract's. This thing was massive; I had to disassemble it to eat it. The soda can was slightly in the foreground so the pic is a bit deceiving. The sandwich was much bigger than it appears. On the advice of a coworker, today I checked out Carbone's Market in Torrington. He recommended their roast beef after seeing my pics from Second Poquonock, claiming Carbone's was superior. It is. It blows Second Poquonock away. The beef is thicker-cut, juicier, tastier, and more plentiful. And a sandwich with "everything" includes cheese, mayo, lettuce, tomato, onions, roasted peppers, oil and vinegar dressing, and what appears to be some kind of Italian seasoning. I should have taken a pic from the side - there were tons of peppers. 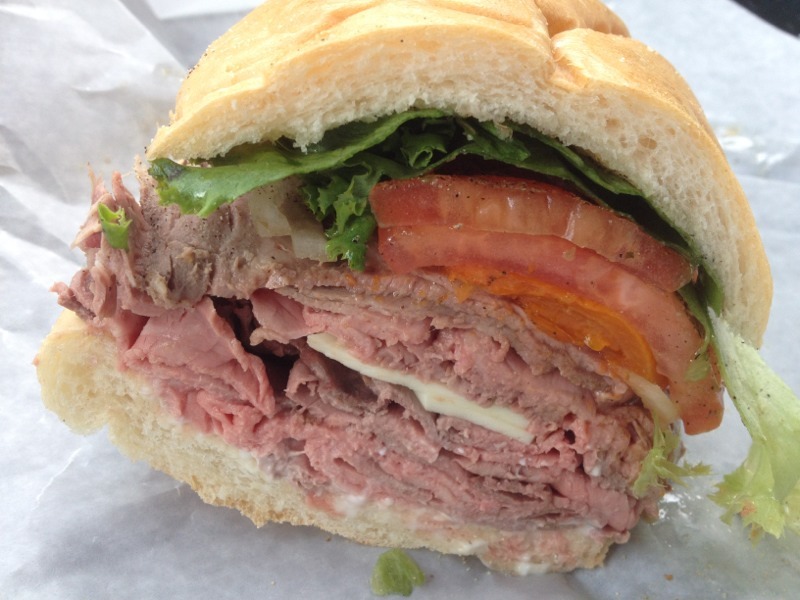 It was the most delicious roast beef sandwich I've ever had. Absolutely worth the drive to Torrington. They also have homemade chili, baked mac and cheese, a great selection of chips including Utz Onion 'n' Garlic (which I'd never seen in stores), and various shelves of grocery items. I foresee many, many trips to Carbone's in my future. What size was this sandwich? Was it the small? And did you ask them to hollow out of the bread? Or did they just do it on their own? If you got the medium sandwich then it's a completely different bread from the small and the large. Carbones uses the Militi bread for the medium, it's a whole loaf. The small and large appear to use what I call the "generic" grinder rolls that most places use, although it does appear that they charged you for the super size. Yeah, it was 8". I didn't ask them to hollow it out. It does help the structural integrity of the sandwich to hollow it out, but with the scarcity of bread, it sometimes felt more like I was eating a wrap than a sandwich. Based on what I've seen here, I will definitely have to get the 12" next time! 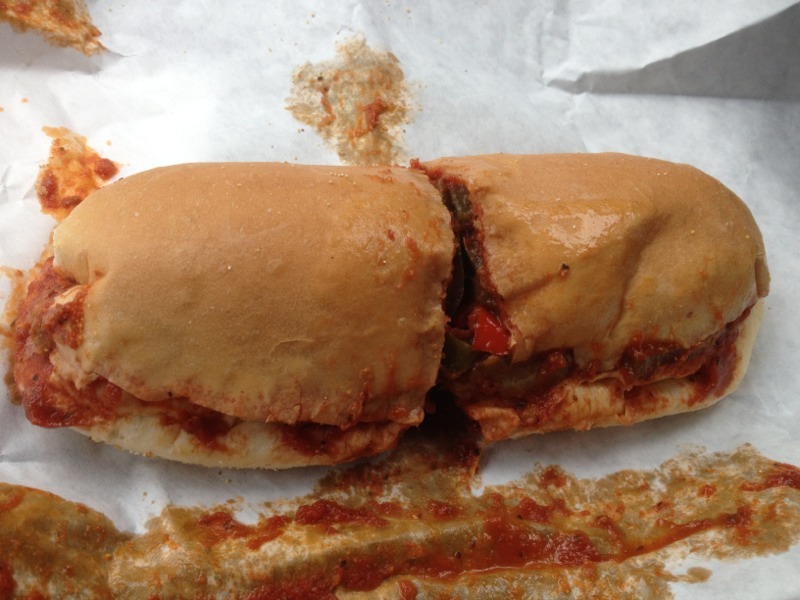 Someone should try the eggplant sub at Skyline in Windsor Locks. Oh, BTW, the chili at Carbone's is excellent. It's very cheesy with a nice kick. You guys should give it a try next time you visit. According to Yelp the Skyline is not where I would choose to eat. Good to know! My coworker told me they change up the hot dishes they have available. They had chili and mac 'n' cheese when I was there. I'm interested in trying anything they cook up. He also told me they do corned beef on St. Patty's Day and only St. Patty's Day (as opposed to other places that will do it the week/month of). He said the last time they did it, there was a line that stretched far outdoors. And apparently around Thanksgiving they cook up turkeys for distribution to the less fortunate. Here's something a little different today: a grinder from the cafeteria at St. Francis Hospital in Hartford. They opened a line recently for made-to-order sandwiches. This was the first time I'd tried it. I asked for ham, salami, pepper jack cheese, pepperoni, peppers (fresh - they don't have roasted), lettuce, tomato, mayo, oil (not sure if olive or something else) and balsamic vinegar. The bread was "Italian Herb and Cheese" and they toasted on request. It was... hmm. It's hard for me to compare it to any establishment, chain or otherwise; institutional cafeterias occupy their own continuum, I think. The three salty meats managed to somehow have not much flavor, the vegetables were fresh but otherwise unremarkable, the cheese was undetectable, and the whole thing was imbued with a certain hopelessness that seems unique to hospital cafeteria food. It wasn't screamingly bad - like that revolting Italian combo I had at Sorrento's in Manchester - more just sort of a vaguely depressing non-entity. Toasting didn't do much for it. Yeah, but considering it is hospital food......it at least looks good and even looks somewhat edible! Those are some amazing looking sandwiches! He asked around and found D'elia's in Norwich, CT, which is near New London in the southeast part of CT. This was circa 1967, dad and mom are now gone, but the family tradition survives. Most recently a niece, nephew, and grandniece came up to Maine, where I now live, and stopped at D'elia's and got cold salami grinders and put them in an ice chest. Yum. These are the same type that I grew up on. On trips south to visit family in southern NJ, I have done the same thing. Bought grinders at D'elia's. They are what I would call a hole-in-the-wall store front, where they bake their own bread. That is what makes a great grinder. They have lots of different meats to choose from, but the basic cold grinder includes the meat, finely shredded lettuce, thinly sliced tomato and provolone, s&p, and is sprinkled with oil. A wonderful place! I drove to Norwich today expressly for the purpose of visiting D'elia's. It was raining, and the Hartford marathon made getting onto Route 2 a little difficult, but I was determined! Note their motto in the lower right - I know everyone here would agree! I knew it might be a while before I managed to get back here, so I ordered two grinders, a small Italian combo and a small meatball-and-sausage combo. As JB-ME mentioned, they bake their own bread, and you can tell. This was an excellent grinder, with maybe the best tomato sauce I've had at a grinder shop so far - better even than my previous best, Maple's. As you can see, they didn't toast it, nor did they ask - but whereas with Franklin this hurt the sandwich's structural integrity due to the overwhelming amount of filling, D'elia's held up just fine. I requested both mayo and oil on my Italian, since that's how I usually do them. 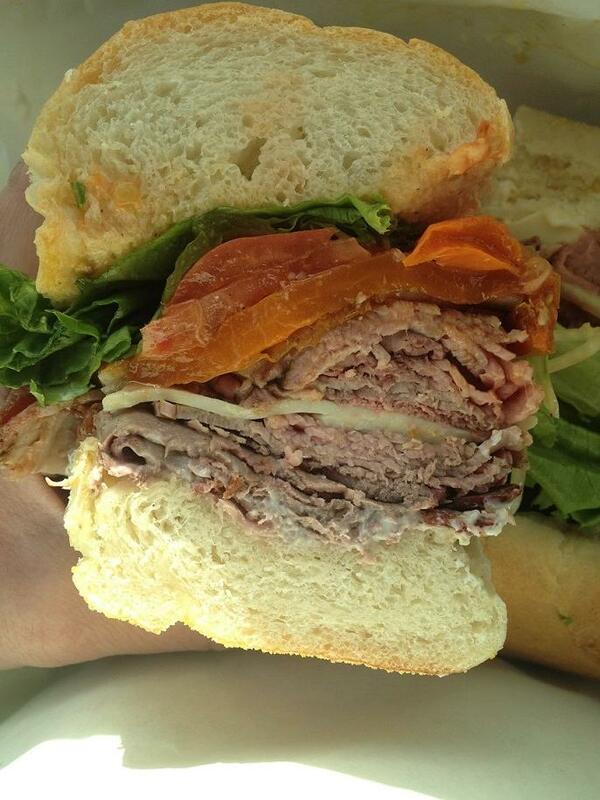 A modest amount of meat, certainly not in the "giant" grinder category. Honestly, it was underwhelming - but you can see on the menu that they also have capicola, pepperoni, and cooked salami. I think the next time I come, I'll add some of that to my Italian. Glad you made it to D'elia's. 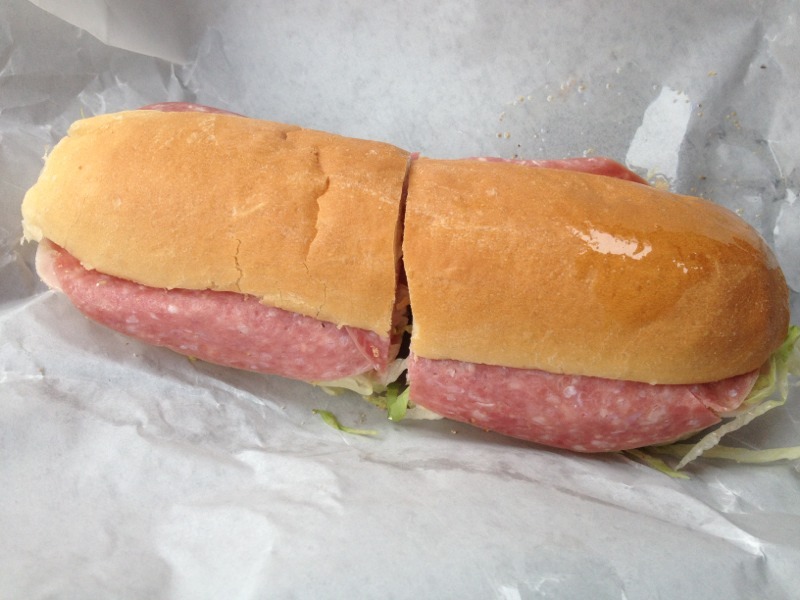 I have the cooked salami grinder with oil, s & p. It is not overwhelmingly thick with meat. 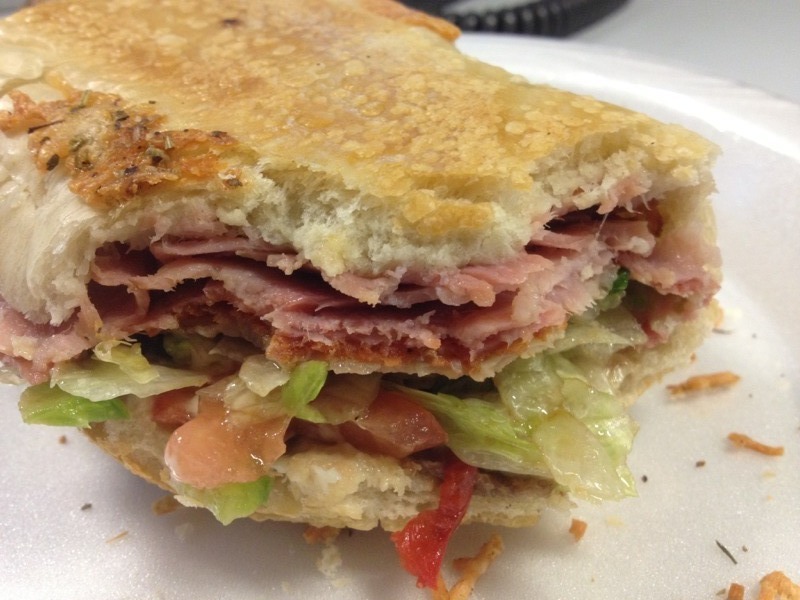 I think it is a good balance of salami, provolone, lettuce, and tomato. Try one that way (no mayo! ), and maybe order one with extra meat. 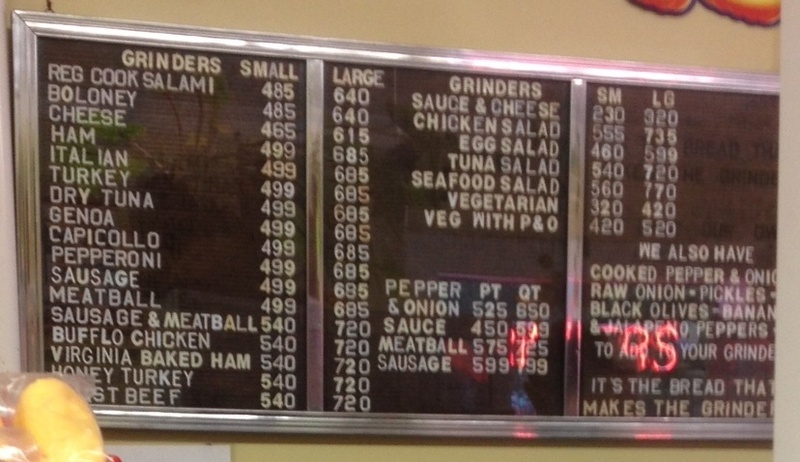 I've never had a hot grinder there, but it looks wonderful. They are an old Italian family-owned business, so they should have a really good tomato sauce recipe! I sometimes buy bread to take home, too. Glad that you said 'on my next visit', which meant the food was worth a return trip. I guess I gave you some food for thought, when I mentioned balance. Are the elements of the sandwich good and did I enjoy it? How long was the trip from Hartford to Norwich--an hour and a half or less? 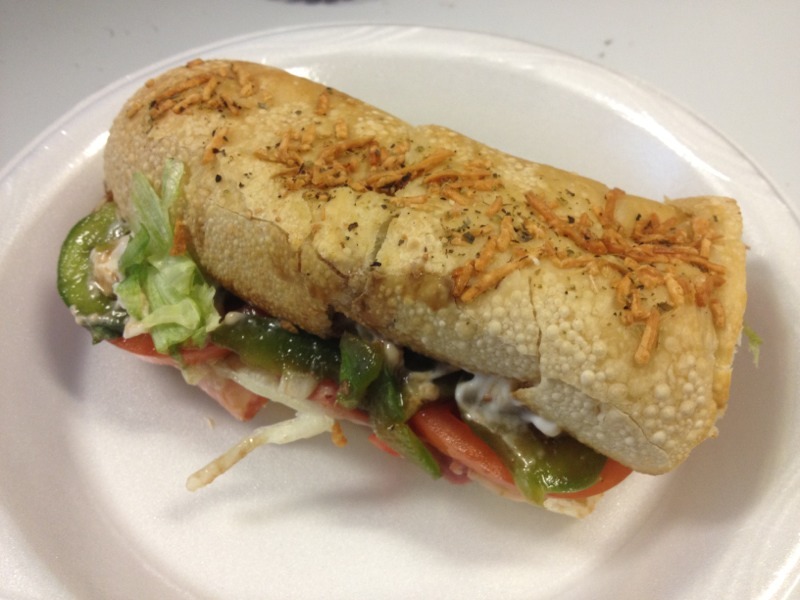 Sounds like you are racking up lots of miles in your quest to discover great subs and grinders all over the state. I'm actually of the camp who doesn't like overstuffed grinders..especially if they haven't hollowed out some of the interior, so I enjoyed the photos. The cooked Salami sounds heavenly.....hope you get back there soon unless I beat you there on one of my trips to NE. The bread was definitely a standout - it did exactly what it's supposed to do, which is to be great on its own but also enhance the fillings. It was soft, chewy and delightful. 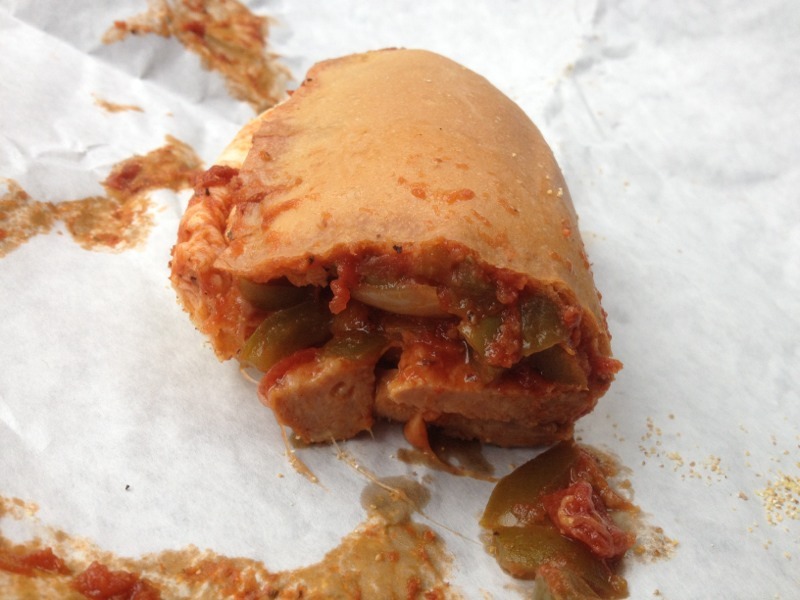 And because they didn't toast it for the meatball and sausage combo, the heat from the fillings warmed it up and made it even softer, without making it fall apart. The result was a sandwich that was more like a melt, something I could practically slurp down, meatballs and sausage and melted cheese and peppers and bread all together. And, as I said, the sauce was also excellent. Whatever dressing they use for the Italian was also very good, and mixed well with the mayo the way I like it in this type of grinder, which was very flavorful on its own terms without being the atomic explosion of salt and spice that one gets from giant grinder establishments.